This question, with its accompanying photo, is typical of several that I receive on the subject of course signage and the Rules. In this circumstance, there is an additional dimension in that the sign is located within the margin of a hazard. a) May they take relief from the sign, without penalty? b) May they rotate the sign to face in a different direction? c) May the sign be completely removed before the stroke is made, as it mentally interferes with the player’s swing? a) No. There is no line of play or mental relief from an obstruction. b) Yes, But it is not necessary, because …..
c) Yes. … Movable obstructions may be removed anywhere on the course. The sign is an obstruction, because it is an artificial object, Definition of Obstruction. It is obvious that the sign is intended to be easily movable and is therefore a movable obstruction, unless a Local Rule states otherwise. If the sign can be easily moved (and subsequently replaced!) the player may move it, as movable obstructions can be moved from anywhere on the course at any time (Rule 24-1). 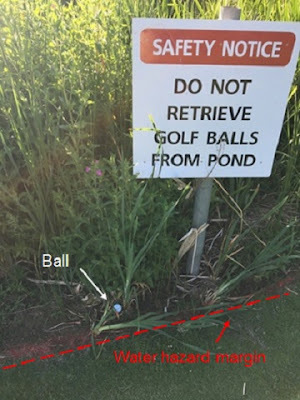 If it is not easily movable, it is an immovable obstruction, from which there is never relief if both the player's ball and the immovable obstruction lie inside the margin of the water hazard, Rule 24-2. For more details on this book click on this link to my Recommended Golf Rules books page and then click again on the cover image for ‘How to Love the Rules of Golf’. This links to the Amazon page for the book and provides an opportunity to check out the opening content and read reviews of Howard's book. Special Offer! Purchase either of my ‘999 Questions’ eBooks (delivered in both .pdf and Kindle formats) and receive a bonus copy of my ‘999 Tips on Using the Rules of Golf to Your Advantage’. Click here for information on the eBooks and prices in $, £ and €.